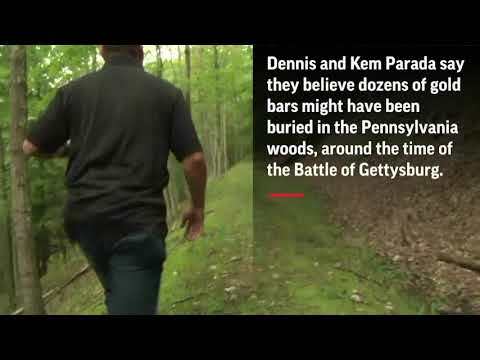 DENTS RUN, Pa. (AP) — Surrounded by dozens of stone-faced FBI agents on a frigid winter’s day, Dennis and Kem Parada stared down at the empty hole and knew something wasn’t right. The father-son duo spent years combing this bit of Pennsylvania wilderness with high-end metal detectors, drills and other tools to prospect for a fabled cache of Civil War gold. They felt certain they’d discovered the hiding place of the long-lost booty, leading the FBI to the mountainous, heavily wooded area last March. Now, at the end of the court-sanctioned excavation, the FBI escorted the treasure hunters to the snow-covered site and asked them what they saw. They gazed at the pit. Not so much as a glimmer of gold dust, let alone the tons of precious metal they said an FBI contractor’s instruments had detected. Since that day, however, neighbors’ accounts of late-night excavation and FBI convoys have fueled suspicions the agency isn’t telling the whole truth. The Paradas are challenging the FBI’s account of the dig, insisting that something had to have been buried in the woods near Dents Run, about 135 miles (220 kilometers) northeast of Pittsburgh. That something, they believe, was gold. “After my years of experience here using equipment, there was something here, something here of value, some kind of precious metal. And whatever it is, it’s gone now. And that’s what I want to get to the bottom of, is what was in that hole,” Kem Parada said. Federal investigators insisted a few days after leaving the site that the search came up empty, adding cryptically that its work there was related to an “ongoing investigation.” The FBI declined to comment further, and a bureau spokeswoman told the AP last week that court documents related to the dig are sealed. The dispute between the Paradas and the FBI is the latest chapter in a mystery that has persisted for more than a century and a half. As the story goes, around the time of the 1863 Battle of Gettysburg, the Union Army sent a shipment of gold from Wheeling, West Virginia, to Philadelphia. The wagon train took a circuitous route through the wilds of northern Pennsylvania so as to avoid Confederate troops. Along the way, the gold was either lost or stolen. The legend has inspired generations of treasure hunters to take to the thick woods of northwestern Pennsylvania — including Dennis and Kem Parada, who spent five years digging in a cave on state land, and two more years drilling atop the cave, before going to the FBI in January with their evidence. The Paradas showed agents how their sophisticated metal detector lit up like crazy when aimed at the spot where they believed the gold was hidden. Within a month, they said, the FBI had hired an outside firm to conduct an underground scan using a device called a gravimeter. The scan identified a large metallic mass with the density of gold, according to the Paradas and Warren Getler, an author and journalist who’s been working with them. So it was with great anticipation that father, son and Getler arrived at the dig site March 13. But nothing went as planned. The treasure hunters and Getler said they had an agreement with the FBI to watch the excavation. Officers instead confined them to their car — out of sight of the wooded hillside where a backhoe was digging — for six hours that first day before they were finally allowed up the hill. The digging proceeded for another hour before an agent called an abrupt halt at 3 p.m., saying the team was cold, tired and hungry and it would be getting dark soon. They were just 3 feet from the target. Whether the FBI actually left the woods that afternoon is itself an open question. Cheryl Elder, who lives nearby, told AP she heard what sounded like a backhoe and jackhammer at least until 2 a.m. — the noisy machinery keeping her awake and annoying her because she had to rise early for work — and she saw that the hillside was brightly lit. The second day of the excavation was similar to the first, according to the Paradas and Getler. They said they were confined to their car for several hours, then escorted up the hill to the dig site — by then a large, empty hole. The FBI had finished the excavation out of their presence, they said. The Paradas said they were cheated of a moment they had spent years working for. After the Paradas and Getler had left, Elder said, she saw a half-dozen black SUVs at the site. One by one, she said, they backed up to the bottom of the hill and rendezvoused with one of several all-terrain utility vehicles. Elder tried using her binoculars, but couldn’t make out what investigators were transferring from the ATVs to the SUVs. Heather Selle, who lives in nearby Weedville, said she was getting her kids ready for school on the morning of the second day when she spied a convoy of FBI vehicles driving past — including two large armored trucks. According to the legend, the lost shipment had either 26 gold bars or 52 bars, each weighing 50 pounds (23 kilograms), meaning it would be worth about $25 million or about $50 million today. The Paradas and Getler say the government contractor’s scan detected a much larger quantity of precious metal — 7 to 9 tons — an eye-popping haul that could be worth more than $250 million if every ounce of it was gold. In May, Cluck filed a Freedom of Information Act request for documents on the FBI’s investigation into the legendary gold. The agency demurred, claiming it had no files it could share. Cluck appealed to Republican U.S. Sen. Pat Toomey for help, and, a few weeks ago, the Justice Department ordered the FBI to do a more thorough review. If the bureau determines there are documents it can turn over after all, it could still take months or years to reach that point.